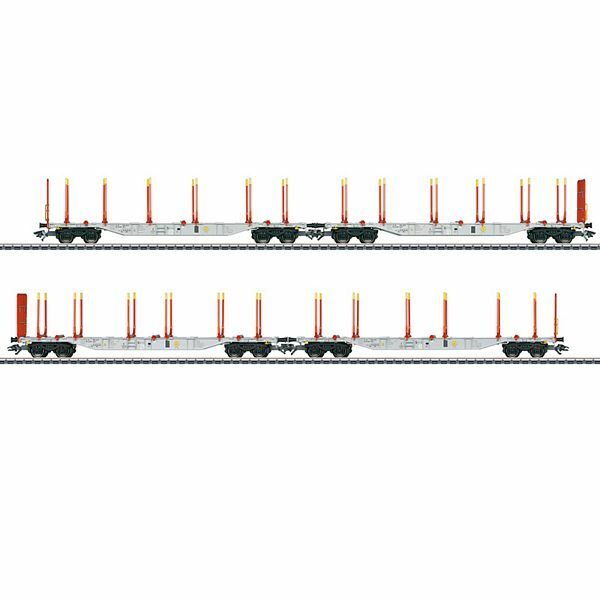 Prototype: Type Sgns 121 four-axle combined load transport cars in a silk gray basic paint scheme. Privately owned car of the firm AAE Cargo, Inc., leased to Hector Rail AB, Danderyd, Sweden. Includes ExTe SR12 wood load frames, supports, and end wall grills, for transporting logs. The cars look as they did in 2014. Model: The cars have type Y 25 welded trucks. The prototypically partially open flat car floor is constructed of metal with striking fish belly style side sills. Each car can be equipped with 6 ExTe SR12 stakes, 3 supports, and 1 end wall grill. Two cars can be arranged as a pair so that the end wall grills face the outer ends of the cars. ExTe stakes, supports, and end wall grills are included for mounting on each car. All of the cars have different car numbers and each car is individually packaged. There is also a master package. Total length over the buffers 91.5 cm / 36". DC wheel set E700580.